This may come as a surprise to some, but not all first year undergraduate students find medieval history as stimulating as those of us teaching it do. Strange though it may sound, subjects such as the Albigensian Crusade or the Norman conquest of 1066, though riveting to us, represent little more than an hour long inconvenience to some students. As such, engaging students with the topic at hand, and ensuring they take away something valuable from each session, is not without its challenges (challenges further exacerbated for those of us who have our seminars at 9 o’clock in the morning!). The question is this, then: as postgraduate teachers, how can we ensure that we capture the interests of the students we teach? There is certainly no easy answer to such a question: if there were then it would have been discovered many years ago. What I have found in my (albeit limited) experience, however, is that tasks which get students really involved in what they are learning are a good way of going about it. Take Urban II’s speech at the council of Clermont in 1095, the focus of my next seminar, for instance. While the varying recorded accounts of this speech are, to historians of the first crusade, veritable gold dust, they can, for students, seem a little inaccessible and uninteresting. In response, I hit upon an idea: why not recreate the speech in my seminar next Tuesday? Why not begin by taking my students out into a nice open space, standing them at varying distances from me and reading aloud a version of the speech? Having done this, I can then herd the students back inside and have them write down as much as they remember of what I just read to them. Whilst this may seem to the student simply a bit of fun, it is in fact a very useful way of highlighting the fundamental points of this particular seminar. First, the issue of memory and accuracy in historical sources is covered. If they cannot remember in any detail what was said only five minutes previously, then how does that effect how we view an account such as that of Fulcher of Chartres, which was written nigh on a decade after the speech? Second, could those who were standing furthest away from me during the speech actually hear? This is a very basic point, but one that again raises questions of the accuracy of the various versions of this speech. Stripping the seminar to its essential elements in such a way is significant as, whilst not every student will continue with medieval history past their first year, the broader skills they learn in the module, particularly those focused on primary source work, will certainly be crucial to their development in subsequent years. There are numerous additional benefits to such an approach. Having completed this opening activity, for example, the students should be sufficiently engaged with the topic and the core issues surrounding it to enter into a more detailed and purposeful discussion than would have otherwise been the case. Similarly, such an approach may serve to make the subject memorable. Whilst many students may not go on to remember the finer nuances of the discussion that followed the activity, they will certainly remember standing in a field being read a 1000 year old text and (most importantly) what this taught them. Finally, and not unimportantly, it might just keep them coming back for more. As simple as it sounds, making a subject engaging is undoubtedly the most effective way to inspire enthusiasm in your students and ensure that they want to develop their understanding of the subject outside their seminars and lectures. Whilst it is understandable that jumping so wholeheartedly into a subject might, at first, seem a little daunting to new teachers, I would implore everyone to a least give it a try. This can be as simple as reading a speech in a field, or as complex as assigning each student an individual character in a full roleplay whereby a tyrannical ruler, for instance, is put on trial. Each person knows what their own students will respond best to. I, for one, know that come next Tuesday I shall be stood in a field pretending to be pope Urban II, whilst my class are having such a good time they may not even realise they are learning! I’m Matt, a second year M3C-funded PhD student at the University of Nottingham with a passion for later medieval history. This is my first year teaching, so I am no expert, but hopefully sharing my experiences will prove useful to some. Matt, you have a perfect storm of challenges: year 1 students, studying a very unfamiliar period/topic for most of them, at 9am. The ‘field exercise’ has all the ingredients of a really good history task – you must let us know how it went. Getting students moving for part of a seminar is always a good strategy and I like this exercise because it focuses on how best to get the students engaged (with a primary source) but also to take away the things that are important for them to learn about the topic. It is (hopefully) also fun (even at 9am and even for you as channelling Urban II will be an experience!). Without fun learning can be a lot harder than it needs to be. You also make an important point about trying something that might seem a little risky. Often this works better than you ever imagine; ok sometimes it goes wrong but that’s teaching for you. And if you keep it simple the level of risk is lessened. 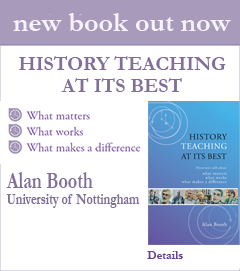 Also trying imaginative new things adds to the variety that is at the core of good history teaching: people learn in different ways and so a good seminar will involve a mix of elements. Kolb in his work on learning theory noted that an individual must first have a concrete experience and then reflect on that in order to generate meaning. Your ‘field exercise’ will certainly deliver that experience and I hope the subsequent discussion will encourage reflection. Perhaps then the students will feel they then have scope to experiment, and so the cycle goes on. What an excellent idea for getting students thinking about the nature of the accounts and what we really know. This fits in very well with much that we know from teaching in schools – if they can’t remember doing it then how can they re-use what they’ve learned? Two further thoughts – always explain to degree students why you are doing an activity they may associate with younger students so they understand your objectives, that it’s to help them learn more effectively. Secondly avoid the word ‘fun’ in your own explanation – let them say it was ‘fun AND useful’. Students can switch off or think you’re desperate if you talk about fun! I really liked this. Student feedback on teaching usually privileges things like enthusiasm and imagination and what you’re writing about here really provides those things. Of course, there’s always the risk that at 9.00 on a cold morning you’re still going to be confronted by tired and resentful students but it’s an interesting approach which challenges students in numerous ways. I particularly liked the idea of re-creating the format of giving the speech since this a mode of delivery which has its own merits and describing it isn’t going to be as effective as doing it. Getting students to discuss what they remember seems to me to be a particularly effective method, especially re-creating the idea of a world in which concepts such as recording the voice were centuries away. Great idea – and for a bonus layer of complexity, maybe you could ask some students to stay inside, and then write down what they found out about the speech after having heard from those present what was said…! Thank you for all your supportive comments. I am back from the seminar and pleased to report it went really well! The weather held out for us and everyone seemed to not only enjoy the activity, but understood why we were doing it. I definitely think I will do something like this again. Excellent idea Matt, and I am glad it went well. I wish I had thought of that when I was trying to get Urban II’s speech across to Year 1 in seminars two years ago! I also thought that Kathleen’s idea of keeping some of the students inside to see what they understood about the subject from their more conventional book learning was excellent too, and indeed represented two different ways in which information moved around medieval societies, as you know. I hope you can pass this successful technique on to the other seminar tutors on that module, and beyond! A great idea Matt -and Kathleen’s suggestion also really good. Medieval primary sources are always a challenge and making students “feel them” is a really good way to empathise with the contents and the context. I have tried something like that by asking each student to “be” a crusader and asking them to find a team to share the crusader experience. They have to circulate in the class and move to find their fellowship. I believe that action -and in your case moving outdoors- is really helpful to get them talking about the experience and then apply their knowledge. Great idea Matt – now I know who that weirdo talking to himself in Highfields Park is! This is a great activity which conveys to students, i) the complexity of accounts of the past, and ii) your interest, enthusiasm and dedication to your subject. Those latter qualities are always valued by students, whatever the topic, even if they don’t feel similarly about medieval history at 9am. I think roleplays and “performing” history, if you like, are incredibly valuable tools for breeding historical empathy and understanding – especially when it comes to teaching complex, morally ambiguous or unfamiliar topics. Your recreation of the speech made the past – in this case 1095 – immediately accessible to your students, deeply memorable too, as you say, and helped them begin to empathise with historical actors, events and experiences which might otherwise seem completely alien to them. I would just second Ian’s point about explaining why you chose to do this activity and why it is useful for their learning/understanding. Doing so will ensure students fully engage with the activity – they appreciate teachers who explain the value and purpose of seminar activities, especially “interesting” ones – and make it far more rewarding for both you and them. Great stuff though! I think this is a great idea and will teach students about orality, memory and the historical record in areas beyond the medieval! Also like Kathleen’s idea of getting some students to stay indoors and have the speech recounted to them. If you think you’ll teach this subject again, why not get them to write an account (or series of accounts) that you then give to the class next year…? Making the learning experience active (i.e. doing something), fun and interesting (or just a bit out of the ordinary) will hopefully help you to engage the students. I’m interested to hear what other approaches you’ve tried.